Vendhaya Kuzhambu / Venthaya Kulambu is a tempting Kuzhambu with lot of health benefits. This is very good for diabetic people and it has lot of fibre in it. 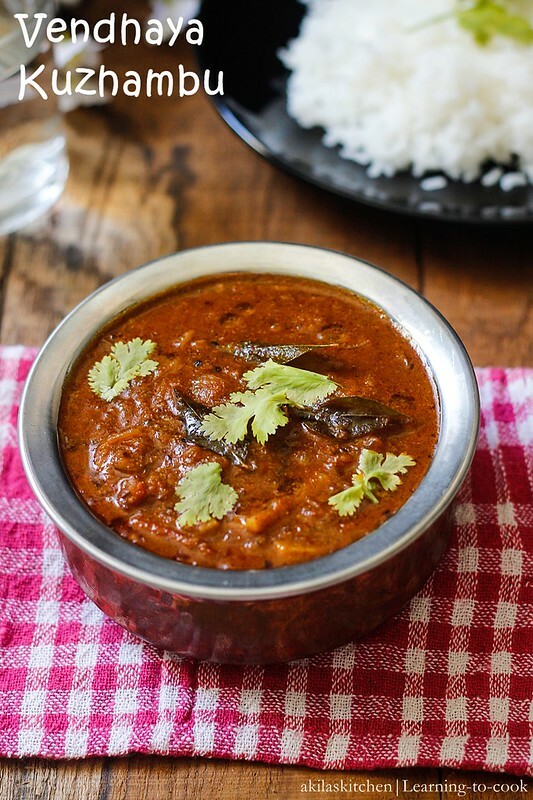 This a tasty, delicious, healthy, tangy and spicy kuzhambu, which I loved a lot from my childhood. 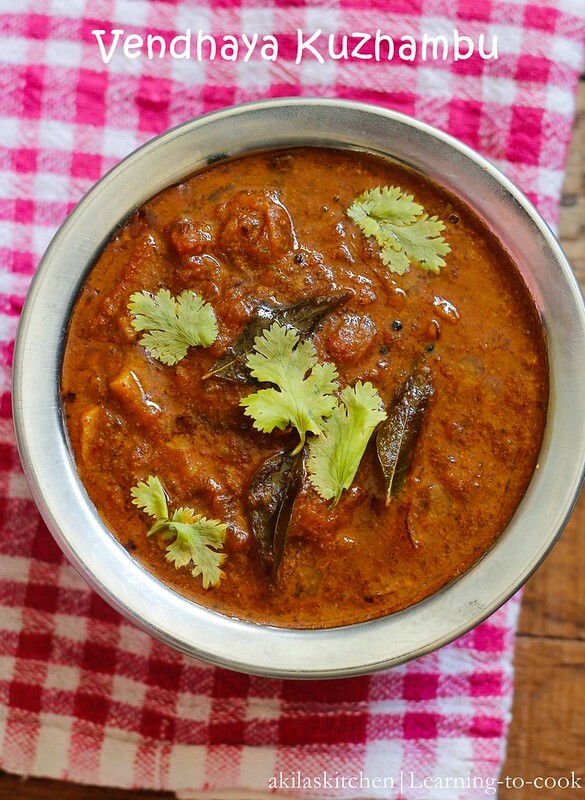 This kuzhambu can be prepared in different ways. People used to grind the shallots along with fenugreek seeds. But this is my simplest way and it tastes very great. 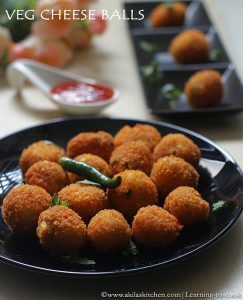 Lets see how to make this tasty Vendhaya Kuzhambu. 1. Dry fry the fenugreek seeds, until they become brown as shown below. 2. Grind it to a coarse powder. 3. Soak the tamarind in hot water for 10 to 15 min. In a wok / kadai add the oil and when it is hot add the mustard seeds . When it splutters add the Urud dal, cumin. 4. Add in the onion, garlic and sauté the onions. Add in the tomato, curry leaves, coriander leaves and salt. Sauté them, until tomato becomes mushy. 5. Add the chilli powder, coriander powder, turmeric, asafoetida. Sauté for 3 min. or until oil oozes out from the sides. Add the tamarind pulp and water. 6. Add the crushed fenugreek seeds and allow to boil for 10 min at least. 7. Garnish with Cilantro and serve hot with white rice. 1. Adding shallots increases the taste. Normal onions can also be used. 2. You can also add 1/4 cup coconut milk. It enhances the taste. 3. My grandma used to add little jaggery. 4. If coconut milk is not added, you can keep it for 5 days in fridge and 2 days if kept outside. 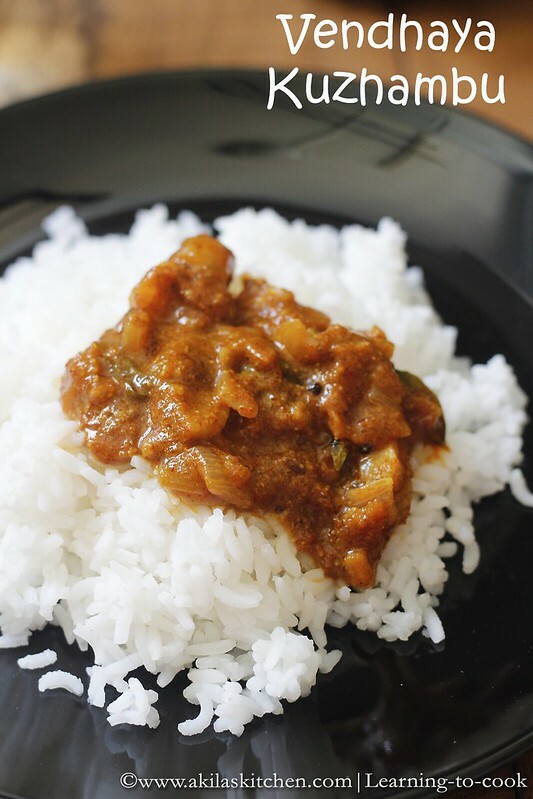 Healthy and tasty Vendhaya Kuzhambu is ready to be served with hot steamed rice. @Sowmya Lakshmi, you can add coconut milk 5 to 8 min before switching off the stove.. Let it cook in medium flame. If coconut milk to be added at what stage we got to add? Looks amazing. Thanks for the recipe. just love this dish, love to try this soon. 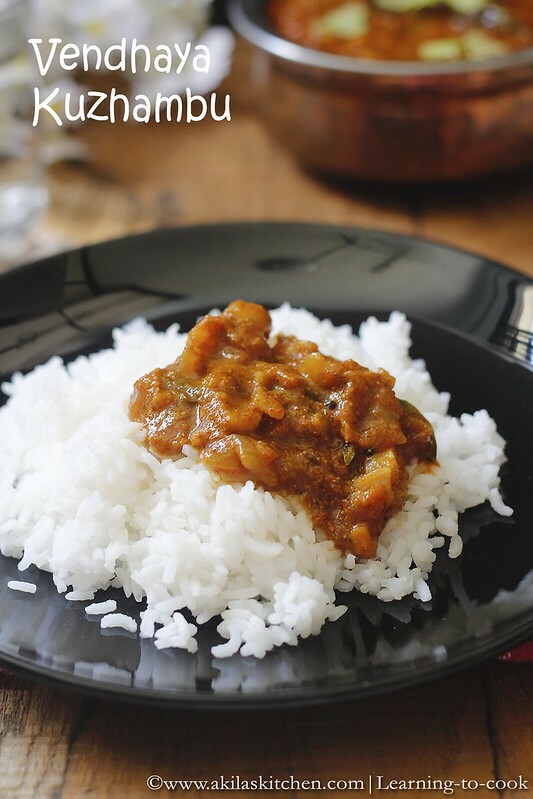 Tempting and tasty curry……. Lovely clicks!! Agreed 100%: its surely tempting and hahaha!!!! yum with rice. Yummy.. I love this kuzhambu 🙂 Looks so good. mouth watering kulambhu …look so good .